Honoring the bond with your pet. Our mission is simple: To treat you and your pets the way we would want to be treated – with compassion and respect. It’s a very sad day when we have to say goodbye to our fur babies. Today Dr. B helped our family say goodbye to our beautiful Italian Greyhound, Bandit. She was 16 years old and could no longer walk or see or hear. Her nickname was Snaggle-tooth because she only had 2 teeth left. But we loved her! Dr. B was amazing. She was gentle, compassionate and caring. She handled the situation with our boys (12 and 14) so wonderfully. Thank you for making such a difficult time a little easier and making it so beautiful. Grace A.
I am so impressed by the compassion shown to my beloved pet and also the support i recieved as caregiver and best friend to Beauregard. I have been in the medical field over 40 yrs as an xray and ulrasound tech. I am so relieved to not be alone in the decision making process concerning the care and end of care of a beloved pet. I have felt guilt in the past having to make the decision on the end of life care of a pet. Did i do everything i could, did i have other options? Is he in pain? I can’t get him to the vet due to back and hip disabilities, did that play a role in the decision i made? I felt all my questions were addressed, i was not rushed. Dr B was very flexible with my work schedule and my Beau really felt comfortable with her. So far i am very happy with his care and highly recommend her for anyone in my situation and she probably is able to adapt to a multitude of situations because character, poise, confidence and expertise is always a winning combination. I highly recommend her. We have a long way to go but i feel less stressed overall. Pat S.
Hospice appointments run 1-3 hours. 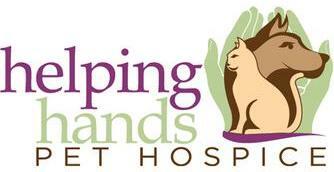 Helping Hands Pet Hospice has a fund through AVMF for clients who can’t afford to say goodbye at home. Please click below to donate. This logo signifies that the professionals caring for your pet have learned scientifically-based techniques to reduce stress in animals. We’re here to help. Please complete the form and we’ll get back to you as quickly as possible. If you would like to schedule an appointment or consultation, please click here to fill out a registration form. If this is an emergency situation, please call us at 727-210-5517.